Log into the vSphere Web Client and navigate to Hosts and Clusters -> Hosts and confirm the CPU and Memory usage of the ESXi hosts. 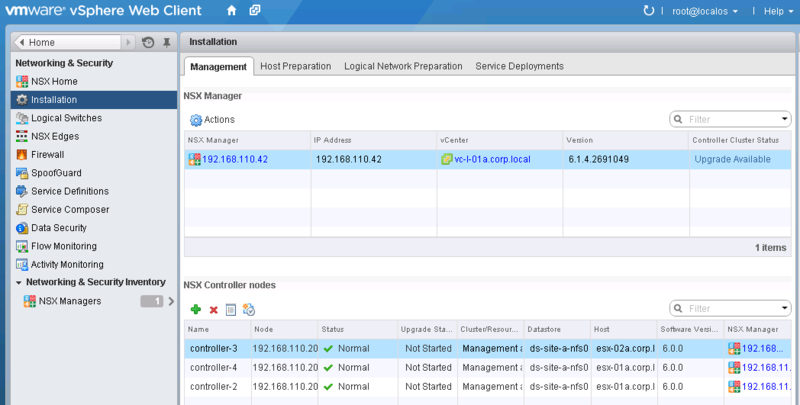 To monitor the health of the NSX Manager, you can log into NSX Manager by navigating to http://IP_OR_FQDN and select Summary. Here, you will be able to see the CPU, Memmory and Storage usage and capacity as well as the status of Services. To monitor the health of your control cluster, log into the vSphere Web Client and navigate to Networking & Security -> Installation -> Management to check the status of each controller node. I understand that NSX components supports only Syslog. It does not support SNMP which is the basic for any networking related monitoring. Apart from syslog what are the best way to monitor the NSX components like Edge, Controller VM, NSX controller etc proactivtely. One way is by using Ping monitoring & what are the best way to monitor it. In case there is OSPF neigh change with NSX edge how effectively i can monitor it.